There is not, as yet, any prize given for “best supporting location” at the Academy Awards. 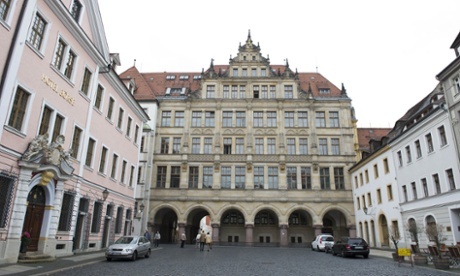 But Görlitz, 60 miles east of Dresden on the German-Polish border, has a history of doing well at the Oscars. There is something of the Midas touch about the Saxon town. It was the birthplace of Emil Jannings, who was in 1929 the first-ever recipient of the Oscar for best actor, for his performance in Josef von Sternberg’s The Last Command. Most recently, Kate Winslet got her hands on a best Actress statuette after visiting Görlitz to shoot The Reader. The locations brought a whiff of authenticity undermined only by that film’s suggestion that the townsfolk tend to ignore their mother tongue in favour of German-accented English. Now the tourist bureau is hoping for prizes again for this year’s unofficial entry from Görlitz: Wes Anderson’s The Grand Budapest Hotel, which is in the running for nine Oscars. While the powder-pink façade of the film’s main location is actually a model, the interior is the Görlitzer Warenhaus, the town’s art nouveau department store, built in 1913. If the film wins, surely it won’t be long before a dedicated movie-locations tour is established in the town. Look to your right and you will see the clock tower from which Daniel Brühl picked off US soldiers in the film-within-a-film in Quentin Tarantino’s Inglourious Basterds. To your left, you’ll see the window out of which Jackie Chan leapt when he was here shooting Around the World in 80 Days (in that instance, Görlitz played the part of Paris). The Book Thief and The Monuments Men have also done their bit to ensure that the tag “Görliwood” is now in serious danger of sticking. The town’s good luck extends to more than just Oscars and tourism. It emerged from the second world war with scarcely a scratch on it. “The architectural centre is intact,” says Andro Steiborn, a producer who has worked with Michael Haneke. 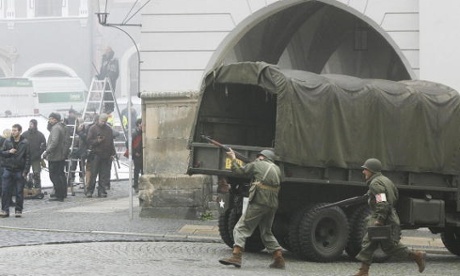 “So it’s one of the few places in Germany where you can shoot historical sequences.” It was also the beneficiary, in 1995, of an anonymous donation of 5,000 to put toward improvements. One local newspaper suggested that Nicolas Cage – yes, Oscar-winner Nicolas Cage – was the mystery benefactor. Well, it would be nice to think that the actor, famed for buying pyramids, dinosaur skulls and haunted houses, had been doing something worthwhile with his money.